Earlier this week a slew of alleged Surface Pro 2 bits reached us by way of a report that claimed the next Surface tablet will sport a Haswell chip, a two-stage kickstand and upgraded specs. Now the same site that brought us that report brings news of an upgraded keyboard cover that it says Microsoft will release as the "Power Cover." According to Neowin, in addition to a keyboard the new cover has a built-in battery to lend the tablet extra power when its reserves run dry. The Surface Pro 2 could drop at any time, especially in light of the recent Surface price drops, but that doesn't necessarily mean the Power Cover will arrive at the same time. 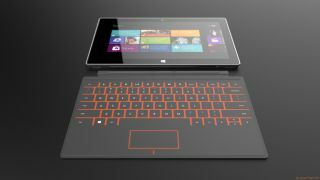 Neowin reported that the Power Cover might not drop at the same time as the Surface Pro 2, but could come at a later date. The site also said that the Power Cover will not work with the existing Surface RT, though it may be compatible with the current Surface Pro. Paul Thurrott's Windows Supersite posted additional details, confirming that the Power Cover actually will work with the existing Surface Pro but not the RT. Thurrott also corroborated Neowin's claim that the Power Cover will launch after the Surface 2 (believed to be the next-gen Surface RT tablet) and the Surface Pro 2. He says all three items will be out by the end of the year. TechRadar's own tests of the existing Surface Pro deemed the battery life more than adequate, so it's a good thing that the Power Cover will reportedly be an optional accessory like the Type Cover - many users probably won't need one. Then again, who's to say what the Surface 2 and Surface Pro 2 will be rocking in terms of battery - maybe they'll need the extra juice. Either way it sounds like we'll be hearing more about the cover this year. Looks like Windows RT is here to stay - the Surface 2 may have been spotted this week running the stripped-down Windows OS.